Limited Edition LP Vinyl version of the album, only 300 copies made! Borghesia was founded in 1982 and is considered one of the founders of electronic body music! Getting its start in 1982, Borghesia is an influential electronic rock group created in Ljubljana, Slovenia by members of the alternative theatre group “Theatre FV-112/15”. The band, along with fellow Slovenian music collective Laibach, were not only at the forefront of Slovenian alter-native music scene, but also on the cutting edge of the burgeoning underground dark electronic scenes. 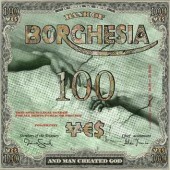 After a period of dormancy from the mid-nineties to 2009, Borghesia began to once again create music. The result of these efforts is And Man Created God. This new album is a compelling, confrontational work of art; the subject matter of this album touches on the idea that the corrupt, diseased systems of old are just replaced with more of the same. As the band says, “…In the meanwhile a bad system was replaced by a worse one. The rich have been stealing from the poor since the dawn of human race. Today these dimen-sions have become absurd: capital, money making money, has become a new deity. Money, this new age golden calf. Money. We’ve all ended up being good consumers. One should fight a system which does not work for the benefit of people. Therefore, the record is entitled And Man Created God. 07 [B] Kaufen macht frei - Buy Baby Buy! 09 [B] Shoot at the Clock!